Strategic Research Communications is responsible for raising the visibility of UH research and innovation programs nationally, among peer institutions and throughout Houston’s regional industry. In addition, the team manages programs to engage UH researchers and inventors, and supports Division of Research business communications. UH Innovation: Major initiative to support and promote UH intellectual property, startups, and industry partnerships. 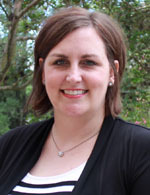 Lindsay Lewis is the Director of Strategic Research Communications for the UH Division of Research. She is responsible for increasing the external visibility of the university’s research programs and engaging the UH research community through ongoing internal communications.